We’ve been using IE 8 for just over two weeks and wanted to run through some of the significant differences that will affect anyone involved in web development, debugging or performance tuning. 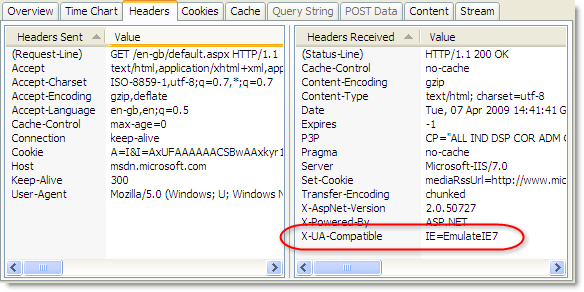 The limit of only two active connections would often cause requests to be queued up in IE until a connection became available. In HttpWatch, this is known as the Blocked time and is shown as a gray bar in the time chart. If you are concerned about your web site’s performance make sure that you also check it in IE 7 as it may be substantially different from IE 8. IE 8 will even attempt to re-start and re-open an individual tab if a problem occurs. Pop-up windows are treated in a similar way and will placed in separate processes if possible. One advantage of this model is that it allows tabs for both protected mode and non-protected mode web sites to be loaded into the same top level window. In IE 7, a separate frame window was created if you attempted to open tabs with different protection levels. Initially, each new tab and pop-up window gets its own process but as the number of tabs grows the number of processes is capped. Once the cap is reached, new tabs will share existing processes with other tabs. By default, the upper limit on the number of processes is based on the amount of physical memory available to Windows. In previous versions of IE, clicking on the blue ‘e’ icon on the start menu would create a new IE frame window in a separate instance of the iexplore.exe process. In IE 8 this behaviour has been changed in an attempt to reduce the number of processes allocated to IE. It now uses a technique, known as Frame Merging, that creates an IE frame window using the existing IE frame process, if one exists. Session level cookies used to be maintained at the process level by older versions of IE. This meant that every time you clicked on the IE icon and started a new IE process you also started a new browser session, allowing you to login into multiple accounts (e.g. multiple GMail accounts) simultaneously. IE 8 does not create a new session for every process, because there could be multiple tabs or pop-up windows in different processes that need to share the same session level cookies. Instead, the browser session is now maintained by the process that contains the main frame window. The default use of Frame Merging in IE 8 prevents the creation of multiple frame processes, so all windows and tabs will belong to the same session. This is identical to the behavior you get in Firefox using a single default profile. But what if you need to log into a web site simultaneously using two or more login accounts ? TabProcGrowth = 0 – a value of zero means use the same process for all tabs, frames and pop-up windows in each browser session. This makes IE 8 behave just like IE 7 on Windows XP. There’s no frame merging and clicking on the IE icon creates a new instance of iexplore.exe in a separate browser session. Protected mode on Vista is not available with this setting because the IE frame and tabs can only operate at different integrity levels if they are in separate processes. This setting may be useful if you are debugging an IE add-on or if you have automated tests that rely on the IE 7 process model. TabProcGrowth = 1 – this means use one process for all the tabs and pop-ups in a browser session and one process for the IE 8 frame window. Frame merging occurs with this setting and protected mode is supported on Vista. You may want to use TabProcGrowth = 1 where you want to keep tabs and pop-ups in one process but still allow the use of protected mode. Specifying a number greater than 1 sets an upper limited on the maximum number of tab processes to use per frame window process. Microsoft maintains a list of web sites that don’t work well with IE 8 based on feedback from users. The IE 7 emulation mode is automatically enabled for thousands site that are in this list, including popular sites such as amazon.com, ebay.com, google.com and even microsoft.com! This button doesn’t appear if the site has already specified IE 7 emulation. Microsoft’s extensive use of IE 7 emulation indicates just how much work is required on a large site to fix up the HTML for IE 8 standards mode and still keep it working with IE 7. ‘View Source’ now opens a window with HTML syntax coloring and line numbers instead of the Notepad window used in previous versions. The only real difference you will see in HttpWatch with IE 8 is caused by the new process model. 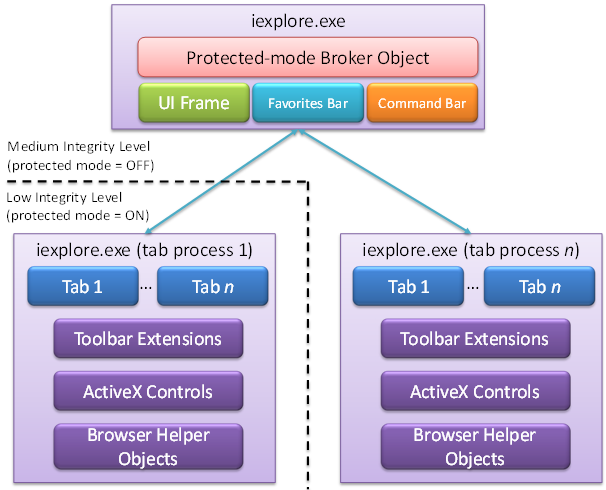 Change the IE 8 process model so that only one process is used for tabs and windows (i.e. set TabProcGrowth to 0 or 1 ). HttpWatch will then record all the traffic in one log file. You’ll also find that HttpWatch shortcut keys will not work in the IE 8 location bar or search field. We plan to fix that in a future update, but in the meantime you can work around it by putting the keyboard focus into the web page itself before using the shortcut key. Why should developers make adjust their websites to IE8 if IE8 still not respect the W3C rules? Not sure if I should go to IE8 or stay with IE7 at this point. Any advice? IE 8 is faster, more secure and has better standards compliance. There’s really no reason to stay with IE 7. Actually, I think you misunderstood. The websites that need to be updated tend to be those which are programmed around the quirks of IE7. These sites will tend to show up erranously on IE8, which is more standard compliant. Hence the required upgrade. Microsoft maintains a list of web sites that don’t work well with IE 8 (….) including popular sites (…) and even microsoft.com! They’re the victims of their own game!!!! Ha ha ha!!! I installed version 8 and regretted it immediately. It would hang constantly. Just trying to launch the program would work only 1 out of 5 times. Once launched, clicking on links was a crap shoot. I rolled back to ie7 and now ie7 which was fine exhibits the same behavior. I even did a system restore to a time prior to installing ie8 but certain settings and / or files keep ie7 just as buggy. Furthermore, after installing ie8, Sharepoint Designer 2007 also hangs the same way. Frontpage 2003 does not. I am considering an entire system reinstall. ie in all versions is now for me inoperable. #4 was really useful for IE8. I have had the same disappointing experience with my IE8 installs. I am still trying to fix it with no success. Apparently going back to IE7 doesn’t fix it either. I have seen a similar comment on the Microsoft forums. I see DCOM error 10000 using Event Viewer that seemed to be related to the IE8 hanging. The error message for the referenced file “\wbem\wmiprvse.exe” is “access is denied” which I don’t understand since Everyone security group has Full Control of the file. I’ve installed IE8 and just can’t get the Ctrl F2 shortcut to work; I have to deal with pop-ups (with the browser/address bar removed) a lot, at the moment all I can find that works is to F11, copy the address and past it into another window that has the httpwatch pane available; if anyone has a simple way of doing it I’d love to know. I don’t know if the fact that the pages I’m looking at only have flash content affects the workaround suggested, but it doesn’t work for me. Please check that both HttpWatch entries are enabled under Tools->Manage Addons and that the keyboard focus is in the window in question when you use Ctrl+F2. 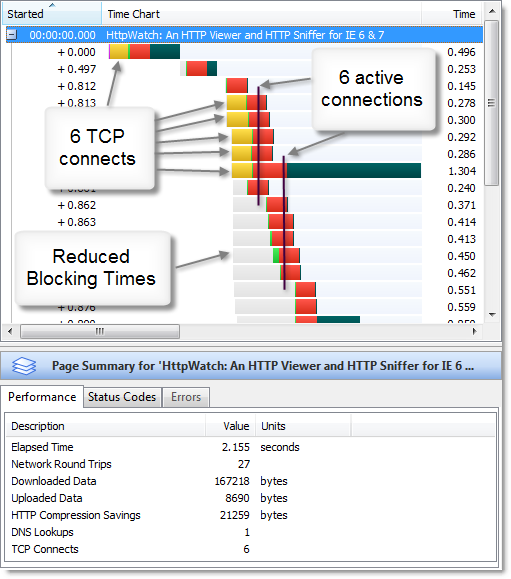 HTTP Watch shows 17 TCP Connects for IE6 browsing the microsoft.com . But the #1 in this article shows only 2. I am confused. The limitation in IE 6 is no more than two active connections at any one time per hostname. It may connect and disconnect several times from each hostname during the page load, but never more than two active connections per host name at the same time. 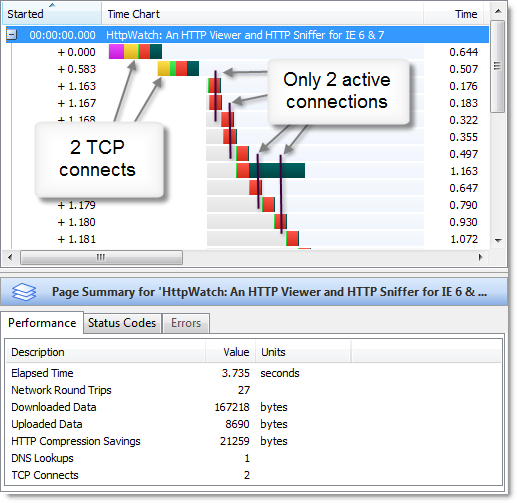 The number of TCP connects shown in the Page Summary of HttpWatch is the total number of TCP connections that were made. It is not a measure of how many were active per hostname. More standards compliant it may be but the simple matter is that it still isn’t compliant. Hence now we not only have to deal with Ie6, Ie7 and Ie8 as separate cases! This is simply ridiculous.